For Your Family Vacation, Special Event, Retreat or Getaway! The Longfellow Guest House is the perfect way to enjoy your Cape May vacation with family & friends. And, we're one of the only pet friendly vacation homes in the historic district! In our f amily since 1851, this beautiful and historic vacation home combines old world Cape May charm with modern comfort. And our ideal location on Hughes Street puts you right in the heart of America's oldest seashore resort. This home has been in our family over 3 centuries and it makes us happy when other families and guests enjoy our home the we have. Creating more memories for a lifetime with family and friends. We've taken this shot every year from the time we were little. 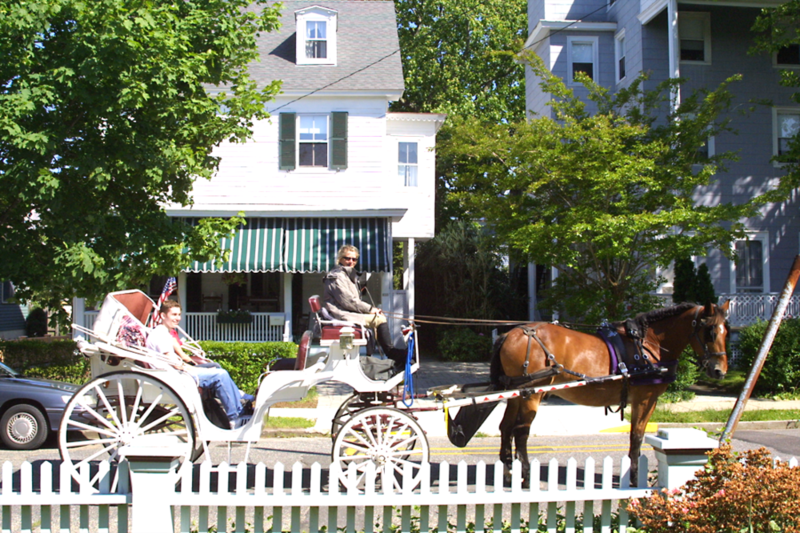 Hughes Street is the oldest and most historic street in Cape May so horse and carriage tours clip clop down our street every day (that's our house). It's a special treat to watch with your family from our front porch. Your kids will love it! 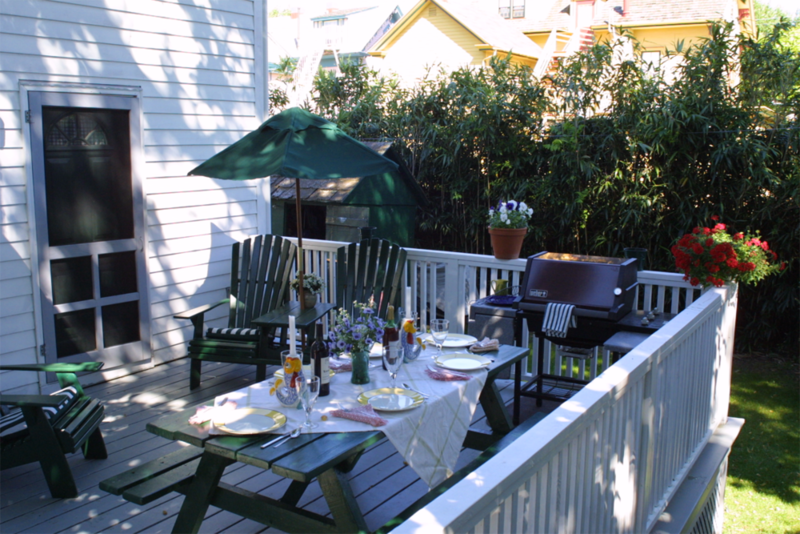 Our back deck is connected to the kitchen and features its own gas grill, picnic table and adirondack chairs. A perfect and private setup to enjoy with family and friends. Many of our guests have been inspired to create paintings and artwork of our house. You'll see samples of that artwork throughout the hallways and rooms, and also on this website. This watercolor is one of our favorites. Our 3 car private driveway is a terrific feature and the front porch puts you front and center to take in the quiet charm and elegance of Cape May's oldest street, Hughes. Cape May is America's first sea shore resort and a wonderful place to vacation with family and friends or even as a corporate or business retreat. Since the Longfellow House is located on Hughes, Cape May’s oldest residential street nestled right in the heart of the Historic Victorian District, you'll be walking distance from our beautiful beaches, town shopping and restaurants, and the area's most spectacular victorian architecture. 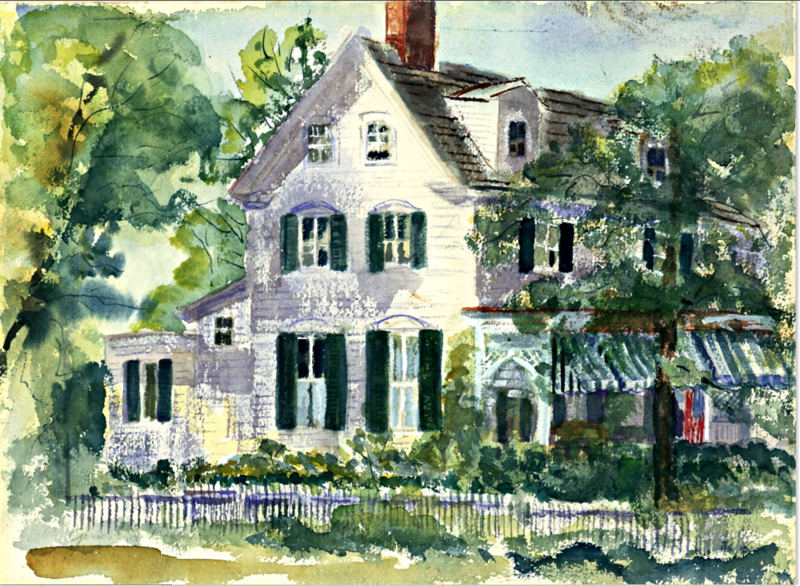 For common questions about Cape May or Longfellow House, take a look at our helpful FAQ page. 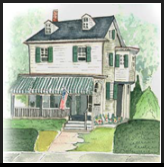 Also, we encourage you to browse around this site as it really presents the story of our home so you can determine if it's a good fit for your Cape May plans. If you still have questions or would like to secure a time, contact us and we'll get right back to you. And thank you! We really appreciate your time and look forward to hearing from you. Sign up for our email Newsletter — Our private email newsletter has become quite popular for hundreds of families and group retreats looking for fun new ideas from local experts (that's us!). We share insights on new stores or restaurant openings, seasonal activities, special events; basically anything that can help you get the most out of your Cape May experience. Join us! Just fill out the Subscribe Form below. Receive fresh content about fun Cape May family activities delivered directly to your inbox every so often. We respect your privacy. Unsubscribe with 1 click. Click here to download our popular Longfellow Short List (it's a PDF). We hope you enjoy it and be sure to share any ideas or discoveries you have. We'd love to hear from you! Henry & Josephine share thoughts about their experience at the Longfellow House. Sign up with your email address to receive fun Cape May tips. We respect your privacy & will never share your info. 1 click unsubscribe. Click here to download our popular Longfellow Family Short List (it's a PDF). We hope you enjoy it and be sure to share any ideas or discoveries you have. We'd love to hear from you! 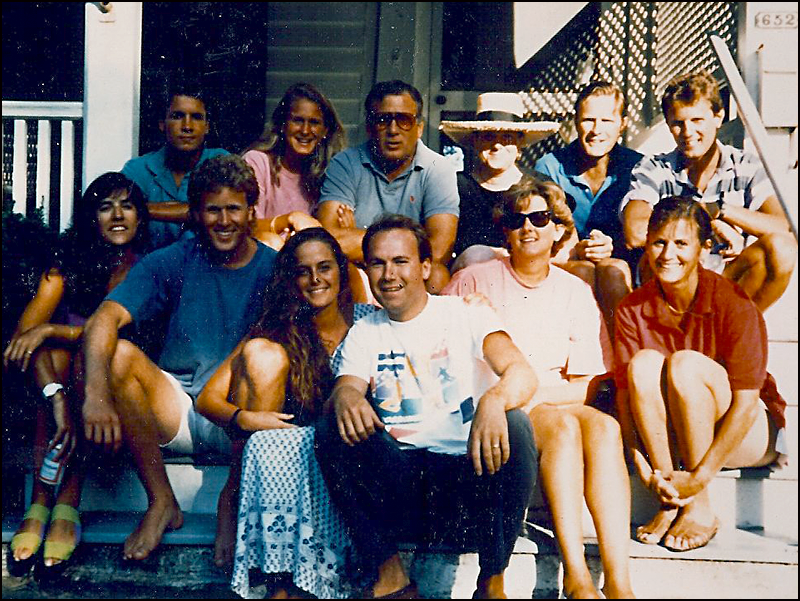 What a wonderful experience, being in Cape May and with family. Thanks you for sharing your lovely, historical home with us.